Our knowledgeable naturalists will guide you on an experience that is educational and exciting. Imagine yourself within feet of some of the most graceful, rare mammals in the world. Our whale watching excursions depart from the Town Wharf in Plymouth and give you the opportunity to view sights that you will never forget. 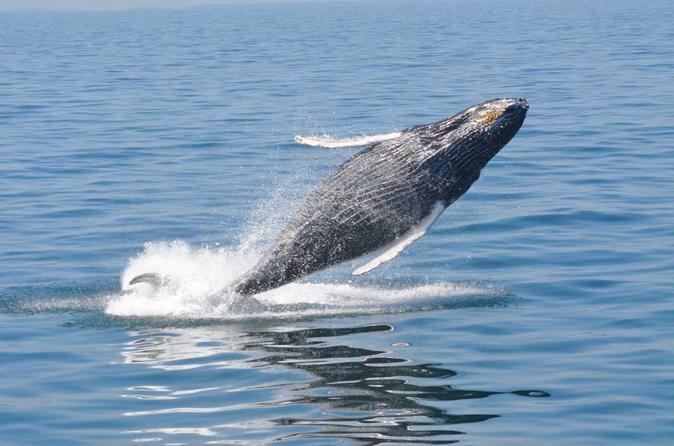 Join us on the journey as we head out to Cape Cod Bay and Stellwagen Bank, a marine sanctuary and one of the primary feeding grounds for Humpback Whales, Finback Whales, Pilot Whales, Minke Whales and the endangered Right Whales. Departing from the Town Wharf in Plymouth, MA, join us aboard a 4 hour whale watch cruise out to Cape Cod Bay and Stellwagen Bank National Marine Sanctuary. This under water plateau is a feeding ground for whales as well as other wildlife. Our naturalists will help explain the behaviors you are viewing from these whales. Sights can be viewed from our upper outdoor deck or from or lower climate controlled indoor cabin. A full galley is available for food and beverage cash purchases. A photographer is on board every trip to take boarding photos, available for purchase to remember your whale watch adventure with. Clean men's and women's restrooms are located on the lower deck at the back of the boat.